As easy as riding a . . .
As a former teacher, homeschool mom and author of the Arithmetic Village series, I have some opinions about teaching math. I come from the perspective that learning math should be like learning anything else, learning to walk, learning to ride a bike, learning to feed yourself or learning to read. Mathematical knowledge should emerge gently and naturally. How can you do this if you, as the teacher, might have unpleasant associations with Math? Think of teaching math like riding a bike. Children don’t wake up one day, jump on a bike and ride it. Nor do they wake up, see an equation and instinctively know how to solve it. First we notice bikes. Then we watch bikes for awhile. They zoom by us, we see how bikes move. 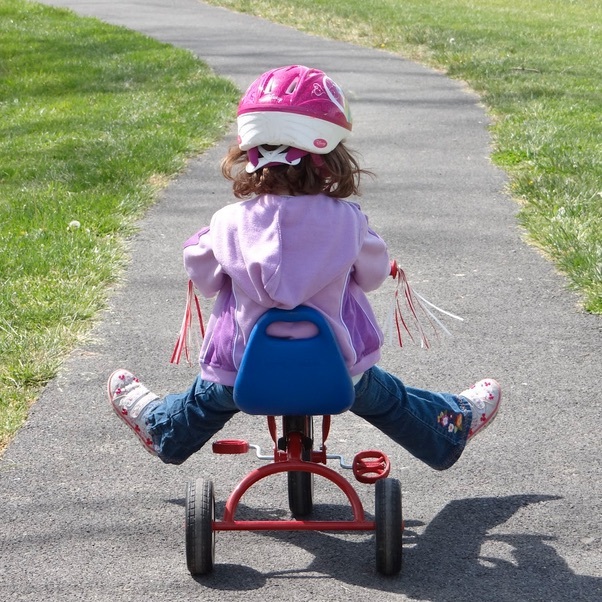 We have fun on riding toys, then tricycles, then bikes with training wheels. Then, when the time is right, we know we’re ready. And we have to be ready, or it won’t be any fun. If we forced toddlers onto two wheelers and strap them in, encouraging them while they fall time after time. that bruised child might become a bit of a “bikeaphobe”. They would not like biking. As a culture, we don’t do that with bikes, but we often approach academics that way, especially math. We wait to take off the training wheels when we know that they are ready. As parents, we know what “ready” looks like, the child is eager, willing and excited. Whether we are aware of it or not, math is all around us everyday, just like bikes. Just observe it: “We need to be in the car in 5 minutes”, “How much are the apples?”, “How many do we need?”, “Would you please set the table for 6 people?”, ” You will need to share those candy corns evenly.”, “How far is it to Grandma’s house?” It’s all math. Children experience it from birth, we just don’t think of everyday life in mathematical terms. To create children who are comfortable around math, talk about it, casually and often. Point math out in your life and in nature when you have the opportunity. Clovers are a great excuse to point out groups of three, maple leave pressings are a lovely way to see the groups of five. Do the flowers that you just picked have the same number of petals? Maybe, maybe not, its something to compare, notice. You had one truck and now you have three. You had four tennis balls and lost one, now you have three. So, talk about math, but avoid being annoying. Children sense the difference between sincere information and over zealous programming. One holiday, my in-laws had the camera pointed at my five year old daughters face. She was in an Easter dress with a matching hat, we had just made a bunny cake, decorated eggs and the egg hunt was over. “What day is it today?” they asked her over and over and over. She was tired. She stared at them. I could see her thinking. Finally, she looked straight at the camera and said “Christmas!”. This was her first joke. My favorite early childhood professor told her new teachers to never ask a child a question they already know the answer to. Once you know the color blue, you don’t have to practice knowing the color blue. It’s disrespectful and insincere. Just be honest – “I want to know if you still know the color blue.” Your child might be less annoyed and more engaged if you remain honest. Another way to help children enjoy math is “acting out” the basic arithmetic functions. My books can help here, they offer children a role model character to emulate, but they’re not absolutely necessary. Simply collect things for addition, lose things for subtraction, count in groups for multiplication and distribute evenly (share) for division. Children naturally incorporate these activities in their play, so when you are introducing math into their curriculum, simply point it out. “You two are very good at sharing, learning division is going to be very easy for you!”. Tea parties are especially good for practicing multiplication. If you are crafty the possibilities of math crafts are endless. My favorite is working out the 2-times-tables with butterfly art. The finished product on a wall with ten butterflies representing 2 x1 through 2×10 can be a stunning and effective visual. Almost all crafts have some sort of mathematical quality to them – geometry, measuring, numbers of elements, etc. Don’t worry. Really. Your child will eventually asks you about representational numbers – this usually happens around a birthday with lots of birthday cards. They will want to know what the number 6 looks like. Children will start writing numbers, when it’s meaningful to them (and when they start writing). As naturally inquisitive problem solvers, writing numbers and figuring out problems will happen naturally. Really. Then children can find joy in finding patterns on number charts, number-lines and color wheels. The early stories, observing, playing, and nature walks will set a solid conceptual foundation for abstract work and memorization. When children are well prepared, they will be far more ready and excited to solve math problems on paper or chalk boards. So to save your child from any “mathpobia” you might have experienced as a child, my advise is to hold off as long as possible with number representation. It is better to be “over-ready” to solve a written problem, than to crash on your first try! Imagine, a whole new generation of people who believe that math is as easy as riding a bike!